A brand new school year has already started, and that means HISD is looking for its next crop of volunteers. Thousands of caring citizens give their time and energy to Houston-area students each year, serving as everything from office helpers and classroom assistants to guest speakers and field-trip chaperones. This entry was posted in Volunteers and partnerships and tagged volunteers on August 30, 2013 by HISD Communications. On Friday about 300 Deloitte employees will be volunteering their day to help beautify three HISD campuses as part of the company’s annual community service project. Nearly 4,000 students from Wharton Elementary, Hamilton Middle and Reagan High School will benefit from this project. At each campus the volunteers will be helping to improve the look and functionality of the school grounds. Beautification projects include placing gravel on sidewalks, painting benches and bike racks on campus, repairing basketball courts, gardening, office organization and much more. This entry was posted in Special events, Volunteers and partnerships and tagged Deloitte, Hamilton MIddle School, HISD, IMPACT Day, Reagan High School, volunteers, Wharton Elementary on June 6, 2013 by HISD Communications. Every year, thousands of parents, businesses, and community partners support HISD students and teachers by donating their time, resources, and knowledge. 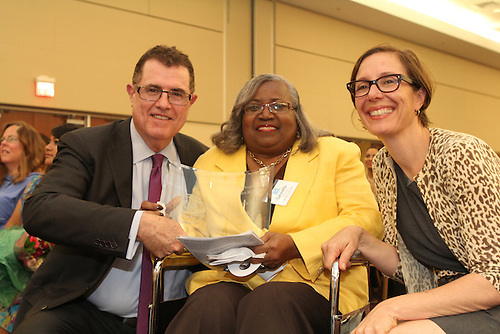 On May 22, 2013, HISD held its annual Volunteers in Public Schools (VIPS) breakfast to celebrate and honor some of the district’s top volunteers. This entry was posted in Achievement/Recognition, Volunteers and partnerships and tagged volunteers on May 22, 2013 by HISD Communications. The Houston Independent School District is recognizing the efforts of thousands of volunteers and awarding the top volunteers of the year at the upcoming VIPS Recognition and Awards Program on May 22, 2013. The Volunteers in Public Schools Program (VIPS) started in 1970 and to date, HISD has more than 30,000 volunteers district-wide who have dedicated countless hours to schools, programs and events across Houston. During the VIPS Recognition and Awards Program, HISD will be giving numerous awards including the Jean Davis Meyer and Special Lifetime Achievement awards recognizing the most outstanding volunteers. When: Wednesday, May 22, 2013 at 9a.m. This entry was posted in Achievement/Recognition, Board of Education, Special events, Volunteers and partnerships and tagged Anna Eastman, education, HISD, Houston ISD, MIchael Lunceford, Rhonda Skillern-Jones, Terry Grier, VIPS, volunteers, Volunteers in Public Schools on May 15, 2013 by HISD Communications. First-grade students at Bruce Elementary School are getting new help achieving their reading goals. The United Way of Greater Houston is partnering with the school in a new literacy mentor program. The program will pair a volunteer and a first-grade student together for the entire year. During that time, the volunteers will read a book with the students and will later help them complete a literacy exercise. United Way President and CEO Anna Babin presented books to all of the first grade students along with a $5,000 check to principal Trealla Epps. Both Babin and Epps said they believe the initiative will encourage the volunteers to develop positive relationships through mentoring and literacy. This entry was posted in Achievement/Recognition, Elementary Schools, Parents, Teachers and tagged Bruce Elementary, literacy, mentor, United Way of Greater Houston, volunteers on December 20, 2012 by HISD Communications. Hundreds of volunteers spent Saturday morning knocking on more than 1,300 doors across the city encouraging students who have not returned to school this academic year to re-enroll. The outreach effort was part of the ninth annual Grads Within Reach Walk, which led to 45 HISD students deciding to return to school immediately and many more promising to give school another try. Dr. Grier later led the volunteers as they knocked on the homes of various students at Austin High School. HISD Board of Education Trustee Juliet Stipeche and Austin High School Principal Jorge Arredondo were among those volunteers encouraging students to re-enroll. This entry was posted in High Schools and tagged Austin High School, Grads Within Reach, outreach, volunteers on September 10, 2012 by HISD Communications. The Houston Independent School District held its Volunteers in Public Schools breakfast and awards ceremony at the Kingdom Builders’ Center on May 30. The annual event honors exceptional volunteer contributions by individuals and organizations and was sponsored by the HISD Foundation and Randalls. The Jean Davis Myers award, which is the highest honor, was presented to Urban Harvest and Pilar Hernandez, an Urban Harvest parent volunteer at Kolter Elementary. The organization was recognized for its volunteer work in improving the quality of education in greater Houston. The organization’s district-wide outdoor learning environment initiative helps teachers create curriculum for outdoor classrooms. The program also provides students hands-on learning in science, math, history, and other subjects. A Special Lifetime Achievement award was presented to George W. Black for his service to HISD’s Volunteers in Public Schools for more than 25 years. Mr. Black, a retired Marine, oversees the student safety patrol and is a member of the Safety and Security Committee at Barrick Elementary. Here is a list of the other honorees. Board Trustee Anna Eastman and Superintendent Terry Grier presented the awards. Dr. Grier said he would challenge anyone to find a more dedicated group of individuals than the honorees and thanked them for their service to the children and schools. “You represent the best of the best: those who contribute their time and energy to Houston’s children every day, without any thought of recompense,” said Grier. This entry was posted in Achievement/Recognition and tagged Eastman, Grier, recognition, VIPS, volunteers on June 4, 2012 by HISD Communications.